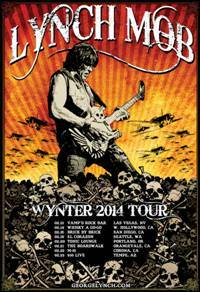 15 January 2014 : Los Angeles, CA…Lynch Mob will rock the west coast in February, delivering classic favorites and tracks from the latest record while introducing a new vocalist for the diversely-pedigreed band. 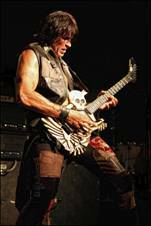 For twelve years with Dokken, George Lynch was able to develop a groundbreaking brand of guitar virtuoso that would also earn a Grammy nomination. In the early 1990s, Lynch launched his own project, Lynch Mob, which harnessed the talent of rock’s best players and released several well-received records, from 1990s WICKED SENSATION to the most recent UNPLUGGED. Tracks like “Wicked Sensation,” “River of Love” and “Tangled in the Web” have solidified George Lynch’s position on Guitar World’s list of Greatest Guitarists Of All Time. Live, Lynch Mob is described as desert- infused blues-based rock with a penchant for extended improvising, harkening back to the glorious jam days of the late 60’s and early 70’s. Lynch’s current work also includes the film “Shadow Nation,” which explores a hybrid way of life, merging modern society with the ancient practices of people who have lived in harmony with the land for thousands of years; native American Indians. The film reveals its message through the journey of a group of renowned musical artists as they share their rock music on a road trip through Indian reservations of the southwest. http://shadowtrainmovie.com/synopsis/ He has also teamed with Arcane Inc. to create a new signature series of Mr. Scary guitar pickups http://mrscaryguitars.com/pickups/. The current iteration of Lynch Mob is an unusual combination of rock backgrounds. Bassist Kevin Baldes is an original member of the Orange County alternative rock band Lit. Lit’s platinum album A PLACE IN THE SUN spawned three top ten hits including “My Own Worst Enemy.” He’s also played with Sugarcult, MEST and Good Man Down. Jimmy D’Anda is on drums. With L.A. based rock band BulletBoys and its hit “Smooth Up In Ya,” he earned a Gold album and toured the world with rock’s biggest acts. This entry was posted in Artist, Bassists, Classic Metal, Classic Rock, Glam, Guitarists, Heavy metal, Internet Radio, Metal, Music, Rock, Rock N' Roll, RockStar, Sleaze, Surrealist, Tattoos, Vocalist, Wornstar Clothing and tagged 80's, Bleach Bang, Bleach Bangs, Bleach Bangs Radio, Charlie Owens, Classic Rock, Dokken, Electric Sister, George Lynch, Glam, Glam Rock, Hard Rock, Heavy Metal, Jimmy D'Anda, Metal, Mr. Scary, Music, Randy Norris, Rock, Rock N' Roll, Rock Star, RockStar, Shadow Nation, Thadeus Gonzales, the Hellion, the Hellion Rocks. Bookmark the permalink.